129 Lake Street is a late 1950s addition to the nineteenth-century St. John’s Seminary on the campus of the Boston Archdiocese in Brighton. 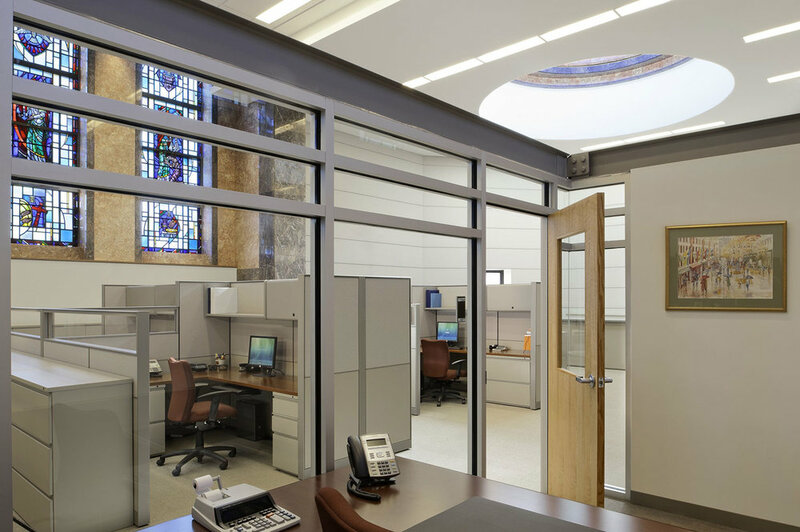 Our adaptive reuse design converted the 90,000 sf, five-story former dormitory, classroom and chapel facility into administrative office space for several Boston College user groups. On the exterior, the project scope replaced all roof surfaces, windows, and doors, as well as extensive masonry repair. Inside, the renovation included a new elevator and significant modification to provide universal access throughout. All mechanical, electrical, telecommunication and life-safety systems were replaced or installed for the first time and integrated into Boston College campus systems. This project required an innovative approach to reusing interior layouts that previously served very different purposes. MDS developed a systematic approach to the conversion or reconfiguration of various spaces: small, former single dorm rooms are reused intact as individual offices and interspersed with open office suites created by removing demising walls. Larger spaces are transformed into collaborative and flexible office environments. A formal dining room was recreated as Cafe 129, a casual eating space with a coffee bar and modern servery to draw BC staff and students from across the Brighton campus.